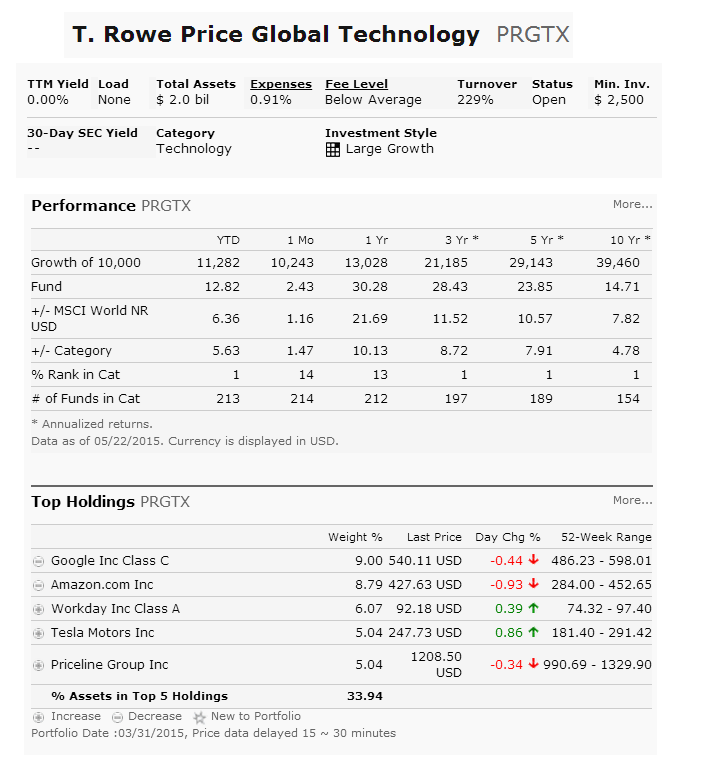 T. Rowe Price Global Technology Fund (PRGTX) is a popular sector stock mutual fund. This equity fund invests mainly in global technology companies. Most of the companies are expected to generate a majority of their revenues from the development, advancement, and use of technology. This mutual fund objective is to provide long term capital growth. The fund manager is Joshua K. Spencer. There is no yield currently. Its expense fee is 0.91% per year. It has $1.97 billion of assets. This mutual fund has no sales load. It has a high portfolio turnover rate of 229%. As of May 2015, top 5 stocks in its portfolio are Google Inc Class C, Amazon.com Inc, Workday Inc Class A, Tesla Motors Inc, and Priceline Group Inc. Top 4 sectors are technology, consumer cyclical, communication services, and real estate. 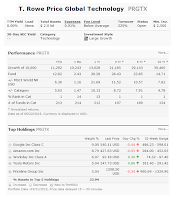 This T. Rowe Price Global Technology Fund has generated great returns for the past 5 years. This fund is very concentrated in technology sectors, and it might be more volatile. There is no yield for income.